Cyclists in the City: Welsh government and Cambridgeshire council announce investment in cycling infrastructure to reduce motor traffic congestion & support economic growth. I'm not sure London knows why it should invest in cycling. London needs to make its mind up. Welsh government and Cambridgeshire council announce investment in cycling infrastructure to reduce motor traffic congestion & support economic growth. I'm not sure London knows why it should invest in cycling. London needs to make its mind up. "No longer will pedal power have to dance and dodge around petrol power - on these routes the bicycle will dominate and that will be clear to all others using them. That should transform the experience of cycling - boosting safety and confidence of everyone using the routes and reinforcing my view that the bike is the best way to travel in this wonderful city of ours." Boris Johnson in a press release in 2009. The Mayor went on to say there was "real excitement about cycling building in the city, and the Cycle Superhighways show we are serious about delivering real positive changes that will benefit us all." And to be fair, there was real excitement. Here was a Mayor who promised big things for cycling, something of a first for London. Ken Livingstone promised big things back in 1981 - 1% of the total transport budget, in fact. It never really happened, though. Neither did Boris Johnson's 'transformation' of cycling, though. Boris's statement is full of useful soundbites about 'transforming' cycling and 'wonderful way to travel'. All very nice. But what's missing from this statement in 2009 is why he wanted to bother investing all this money in cycling in the first place. Hop to over to Cambridge and the story is quite different. Cambridgeshire council has just completed the upgrade of a path that connects the city with a commuter village three miles away. The council has bought land alongside an existing shared space path (not ideal but...) to make it wider and easier for more people to cycle along. It has even added night-time cats eyes to provide some sort of lighting at night. Why is the council investing all this money in cycling? Simple really: The council wants to "attract extra commuters to cycling, helping to reduce traffic congestion in Cambridge". In fact, the county council wants to build a ring of bike routes to neighbouring towns, some as much as 15 miles away. It wants to do this because it believes cycling can help cut traffic congestion and also to "support economic growth". Cambridge went one step further and stated in February: "This council recognises the...importance of cycling for the economic prosperity of the area"
Flick to Wales, which this week announced it intends to legislate, making it a legal requirement for local authorities to plan “fully integrated transport networks”. Talking to The Times newspaper, the Welsh government's Transport Minister said that the Bill would: "improve public health, reduce emissions, boost tourism and provide an economic benefit in deprived areas". There we have it: Wales and Cambridgeshire see cycling infrastructure as part of a plan to reduce traffic congestion and to support economic growth. These are discussions that London is missing out on. I've sat in meetings about the Mayor's plan for a junction safety review, I've met several London assembly members and more recently met Transport for London officials and some of the senior advisers working with the Mayor. What I sense from those meetings is that we're all busy talking about improving safety for people on bikes, and rightly so. But what's lacking is a real understanding of why we're doing this and what the 'cyclists' are complaining about. My own view is that London hasn't yet put a stake in the ground and declared that cycling should be a a serious part of the transport mix, that can reduce motor traffic congestion and has a meaningful economic contribution to make. It's about time London woke up to the fact that cycling is part of the transport mix and that it has a part to play in creating and sustaining jobs. After all, Cambridge has a booming economy and the city is growing like wildfire. It has clearly thought about why it wants to include cycling as part of that growth story. London needs to do the same. Hmmmm. For the bicycle to “dominate” or to become a serious part of the transport mix, TfL needs to change the road user hierarchy, to something like that adopted by boroughs such as Camden (pedestrians>cyclists>buses>commercial vehicles>motorcycles>private cars) and away from the self-selecting hierarchy and elite which is the true outcome of the “freedom of choice” philosophy principally associated with modern conservatism and, to be fair, with New Labour. That also must imply abandoning Network Assurance (“smoothing traffic flow”) as the be-all-and-end-all of roads strategy. How is that likely to happen? Not, I reckon, by having faith in Boris’ better nature. He will need to have his feet held to the fire, every day, over the promise he made (but I am sure didn’t mean) to “Go Dutch”. For that to succeed, cyclists need to build alliances with other de-privileged road users, notably residents, pedestrians, elderly/disabled people, and parents who want their young children to be able to walk or cycle to school and to play in their own streets like they themselves did a generation ago. In that respect at least, perhaps in that respect alone, Andrew Gilligan was right about cyclists widening their focus. I reckon 90% of our interests overlap: the remaining 10% where others’ interests conflict with ours, we should gracefully accept for the greater good. Really interesting, the relationship between infrastructure and growth. I found this old Greenpeace-commissioned report that finds no evidence that road capacity leads to economic growth. http://www.eco-logica.co.uk/pdf/GPRoadsJobsEconomy.pdf I wonder if the same would be true of cycle infrastructure. Certainly at the science park where I work (not Cambridge or London), managers at tenant companies are concerned about how potential employees might commute without a car and there is often talk of bus links to nearby towns. Cycling would be a perfect fit here if only the infrastructure was there. At least these examples in Cambridge and Wales are being set, progress will be slow but these steps will help. I expect Boris will need a nudge or two or three and more campaigning and demonstrating will be needed. Some very good points by Paul about cyclists forming links with other de-privileged road users. Maybe areas where old peoples home etc could be helped by re-planning of street layout cycle groups could offer their planning expertise to extend a helping hand. Alliances would help to change the view of cyclists as one group and strengthen our public image. Might help to dis-spell such stereotypes of us being dreadlocked red light ignorers. Exactly what I mentioned over Twitter Danny. For cycling campaigning to move forward, we need to broaden the sphere of discussion. We need to talk about the humble bike as just one piece of the jigsaw in creating a city that is cleaner, where citizens have greater mobility, greater health and where town centres and high streets can be rejuvenated from the economic benefits that arise from greater provision for cycling and walking. Ultimately what's needed is a more coherent framework for the "liveable" city, so that people who just don't like bikes and will never use them no matter how good the infrastructure, or those for whom cycling just isn't practical, are actually brought into the discussion and made to realise that a bike can actually help build a city where everyone benefits. Over at Cycle Lifestyle, Ben Irvine is listing a hundred reasons to develop a revitalised London Cycling Network. Conversely, I am not particularly aware of a good reason to pursue an alternative course of action. If Ben can think of a hundred reasons to do something, and if nobody else can think of a single reason not to do it, one has to wonder (to quote Ben) "what it is, psychologically, that makes people find it so hard hard to engage with the idea" of a revitalised LCN. I think - as I touch upon here (http://invisiblevisibleman.blogspot.co.uk/2012/05/thoughts-on-electoral-cycle.html) - that the London Cycle Network's biggest problem at the moment is that it was devised under Ken Livingstone. Dangerous, slippery lines of blue paint down main roads are the order of the day now and the new mayor has no time for the more complex, backstreet routes of the LCN. The Cycle Superhighways also reflect the way the mayor himself cycles. As I related in the blog above, he doesn't seem to like planning complex routes (as use of the LCN can require) and seems to want to pelt down main roads. He doesn't seem to get it that other people are prepared to plan their routes and don't always want to take their chances on the busiest roads. Thanks for this, Invisible Man. Just on a point of fact, the London Cycle Network was launched in 1994 when Steve Norris was Minister of Transport. In 2002, Ken Livingstone withdrew funding for this network, concentrating instead on "a slimmed-down 'spine' network of cycle priority routes", the LCN+. This project ran its course for seven years, and has now also been abandoned. I am seeking to take the best of these two networks and revitalise them. David Arditti is absolutely right to say that there is no point returning to a model of cycle planning that's got more to do with Hampton Court maze than with serious and efficient transport. First and foremost, the routes on a cycle network should be meaningful and direct. If a route is not safe now, it can be made safe; but if a route is not meaningful and direct now, it might never be meaningful and direct (please see here for more details: http://www.bikemapper.org.uk/about). Unfortunately, the cycling lobby is not thinking in terms of a network, against all the best advice, and I simply do not understand why not. I doubt that my views will be seen relevant to the current mode of cyclists, however, having used both cycles and motor cycles for commuting to London from Dagenham since 1952 to 2001 I have seen some changes!!! Now at the age of 75 I still use a bike and yes was on the on Dutch event riding from Barking with a group, travelling the route allocated and then riding home with a fellow cycist from the run. The A13 was part of my route and I can assure you there have been massive changes since my working days, a completely off road track from Caning Town to Barking, a lot safer than when I used it. Yes there is a lot to do throughout the country and the majority of people now are too car minded, but there is now a huge interest in cycling, I am certainly impressed with what has been done, especially by the LCC and they are still working hard, the Politics, well who is ever going to believe all that is said about action to be taken, not me. Yes I drive, but a small car and the bike does most of my local jaunts and will do for as long as I can manage. Well-said, Danny, very important point. Invisible, I think you are getting the choice wrong. 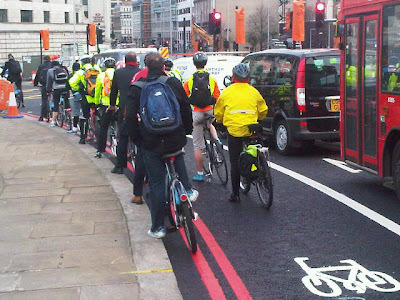 It is not between the type of Cycle Superhighway the Mayor is delivering and complex back-street routes a la the LCN. These are both second, or third-class solutions that will not achieve their objective. Cycle routes that really work are direct, simple, efficient, attractive and safe. The challenge is to design these, on whatever class of roads. The Mayor is actually perfectly right in thinking cyclists would prefer routes, by and large, on main roads, as these generally are the straightest, most direct, and flattest routes around London. Where he is going wrong is compromising much too far on the standard of implementation, particularly opting for poor treatments, with loss of cycle priority, at junctions. In the wake of the Go Dutch campaign it is important that London's cyclists remain united in demanding first-class solutions, which the Mayor has promised, by signing up to that campaign. And when people advocate "reviving the LCN", one does need to ask them what exactly they mean. There's no point returning to a model of cycle planning that's got more to do with Hampton Court maze than with serious and efficient transport. I think you need to be very careful about what you hold up as good examples. Press releases from councils in Cambridgeshire and Wales shouldn't be trusted any more than those from London. As it happens, I know the Cottenham to Histon route as it was. Truly terrible, and it was described well by a local blogger before the works took place. Not nearly all the issues documented were addressed by the new work. What's more, once you reach Cambridge you have to ride across this junction and then along this road. This is all far less than ideal, and not really in advance of what exists in London. It's vitally important to make sure that examples of good practice really are examples of good practice, and not just the propaganda style writings of people who are paid specifically for their ability to write that great things have been achieved. Don't believe press releases, and make sure that you always aim high enough.